Wellington, Alexander Turnbull Library MSR-15 (Margaret M. Manion, Vera F. Vines, and Christopher de Hamel, Medieval and Renaissance Manuscripts in New Zealand Collections (Melbourne, London and New York: Thames and Hudson, 1989), no. 133); part of St Matthew’s Gospel, glossed, Italy, mid twelfth century. This is one of the manuscripts acquired by the then British and Foreign Bible Society in 1932 from Masterton printer Albert Clemas (who had purchased it a few years earlier in London) and now on loan to the Alexander Turnbull Library. The binding is fifteenth-century. The cover is now gone, leaving the beveled wooden boards bare. The quires are sewn onto three double, tawed thongs, which were once stained crimson. They were laced directly into the boards’ edges and emerged in small straight channels in the outer face of the boards, where they were secured using iron nails. There are two endbands—plain stitching over single, red-stained, tawed cores which were laced in a similar style at the corner of the boards. 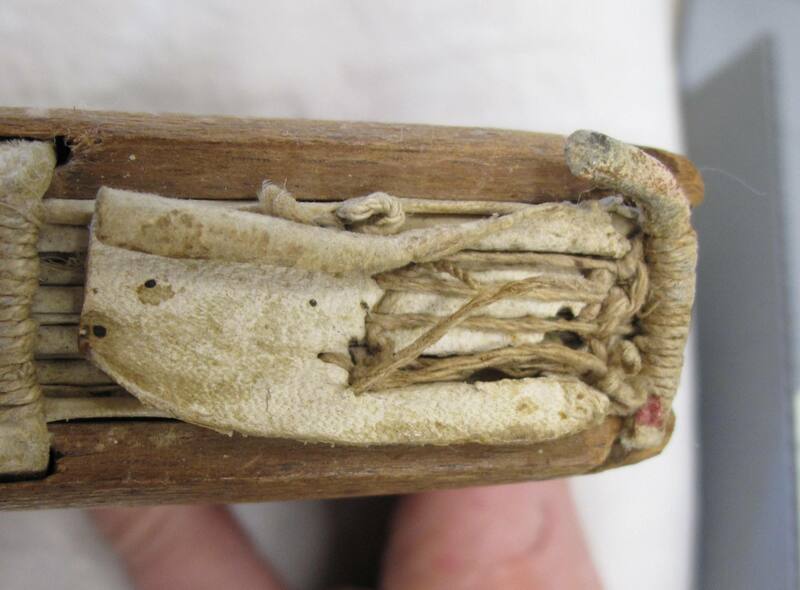 A piece of white tawed leather has been used to line the spine where the stitching for these endbands enters the quires. If the book ever had a cover, its disappearance while many other features of the binding remain intact may suggest it was textile. 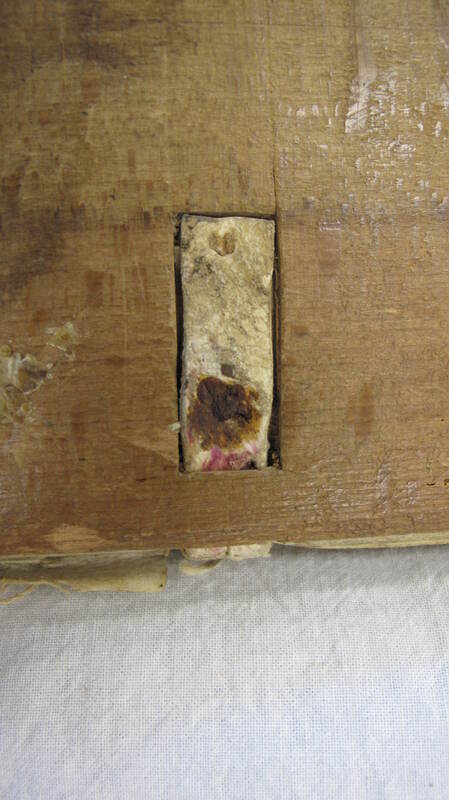 A tiny fragment of textile adhered to the inner face of the upper board, and the smooth surface of the boards adds to this supposition: the surfaces of wooden boards were roughened in various ways to improve the adhesion of leather covers. If the cover were textile, then it would have matched the book’s silk fastenings nicely. 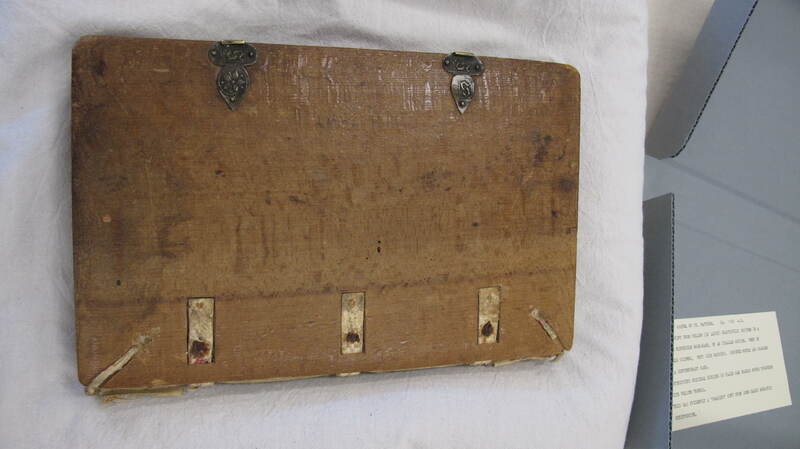 Fragments of the green silk straps are visible on the upper cover, fixed into grooves cut in the boards by three radiating ornamental brass nails. The hooks do not survive; the catches are on the lower board, as is often the case with Italian books; they have a simple trefoil shape very similar to Szirmai’s Fig. 9.54 [i], an Italian type. They are embossed: the letter “s” is used twice on the upper catchplate, and once on the lower, with a small floral stamp. Two endleaves from a medieval manuscript survive. They are palimpsests; the manuscript that was used was copied in a late medieval documentary (i.e. cursive) hand with red capitals but the text is illegible. Images here are reproduced by kind permission of the Alexander Turnbull Library; thanks especially to Ruth Lightbourne for her assistance. See Hollis and Barratt, “Introduction: The Formation and Reception of Medieval Manuscript Collections in New Zealand,” in Migrations: Medieval Manuscripts in New Zealand, ed. Stephanie Hollis and Alexandra Barratt (Newcastle: Cambridge Scholars, 2007), 17; Christopher de Hamel, “The Bible: Illuminating the Word,” in The Medieval Imagination: Illuminated Manuscripts from Cambridge, Australia, and New Zealand, ed. Bronwyn Stocks and Nigel J. Morgan (South Yarra: Macmillan, 2008), 19-23 (22). See Hollis and Barratt, “Introduction,” 16-17. J. A. Szirmai, The Archaeology of Medieval Bookbinding (Farnham: Ashgate, 1999), 230. 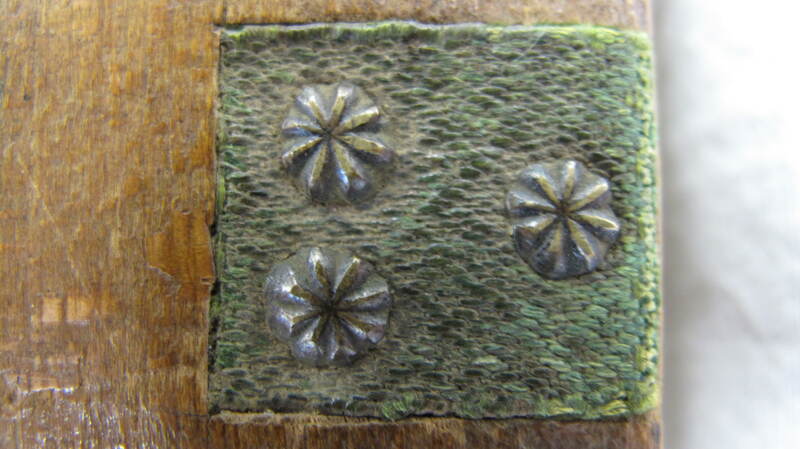 I am curious about your dating of this binding to the 15th century. 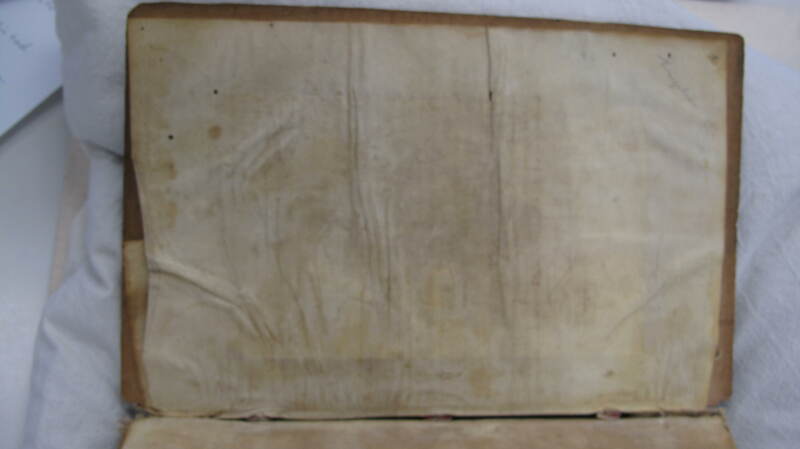 The board attachment system, and also the complex tab endband shown in the photos could indicate an earlier date, closer to that of the manuscript itself. Are there particular details that point to the later date? 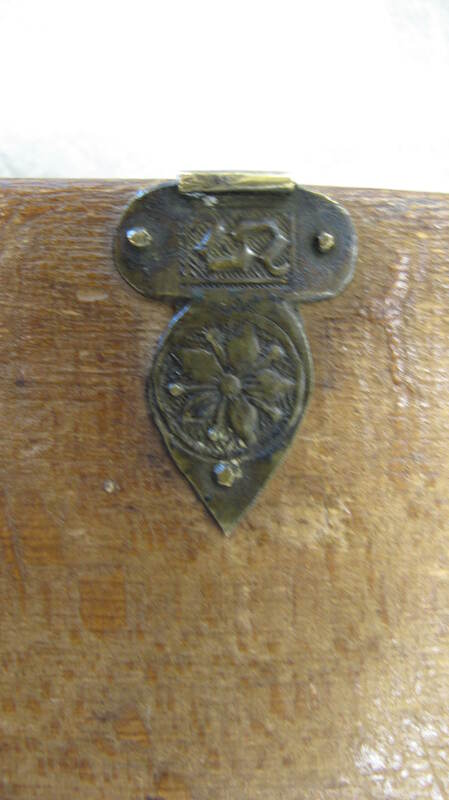 I have a particular interest since I am trying to date a pair of Italian book boards that are associated with a 14th century manuscript I am currently working with. Thanks very much!